^ Saxon, Wolfgang (26 December 1996). 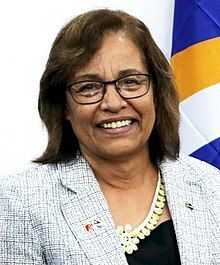 "Amata Kabua, 68, President Of Marshall Islands, Is Dead". The New York Times. Retrieved 28 January 2016. ^ Hassall, Graham; Saunders, Cheryl. Asia-Pacific Constitutional Systems. Cambridge University Press. p. 264. ISBN 978-0521033411.